Oil prices are trading flat once again, mirroring Friday’s small price fluctuations. We seem to once again be going through a downward trend after peaking above $70, a head and shoulders pattern signaling that the bulls don’t have the strength to support a rally at this time. If that’s the case, prices are likely heading towards $65 once again, and markets will probably be range bound between $65-$70 until something (tariffs, Iran sanctions, etc) shake up the market. Crude oil is currently trading at $68.04, picking up 29 cents this morning. Fuel prices are equally as unmoved, though both gasoline and diesel prices picked up small gains on Friday. This morning, neither product is making much headway. Gasoline is currently trading at $1.9754, a gain of 0.5 cents. Diesel prices are even less enthusiastic, trading at $2.2195 with just 0.1 cent gains. 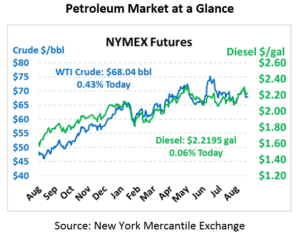 Despite last week’s mediocre results, data from the CFTC (the entity that regulates futures markets) shows that traders have been steadily moving back into oil, betting on higher prices. While well below January’s highs, traders have become more bullish over the past four weeks, possibly setting the stage for a November rally when Iran sanctions go into effect. Today is, historically, the most active day of the year for hurricane activity – and the 2018 Hurricane Season has not disappointed. There is roughly a 90% probability of an active storm occurring on Sept 10 in any given year. This year, Mother Nature chose to raise the stakes a bit, sending three active hurricanes hurtling across the Atlantic towards the US, along with two disturbances worth watching. Mansfield has initiated Code Orange preparation procedures for North Carolina, South Carolina and Virginia. Our teams are following all loads in these markets into the ground and request that our customers try to order deliveries 48 hours in advance in these markets for proper preparation. Hurricane Florence is the currently the most actively tracked storm, given its proximity to the US. While early models predicted the storm spinning off to sea, the latest models show the storm stubbornly pushing eastward for an impact in the Carolinas on Thursday. The storm is expected to intensify into a Category 3 or higher today, likely maintaining its strength as it moves towards shallow, warm coastal waters. Unlike Hurricane Harvey, Florence likely won’t have any significant impact on national fueling infrastructure, but power outages and severe winds are likely to affect local terminals. While the national impact on fuel should be minimal, Florence could have a significant impact on East Coast freight markets, given the importance of East Coast ports in international trade. Mansfield is closely monitoring the storm and will continue providing updates as the storm’s path becomes clearer. Behind Florence are two more hurricanes – Hurricane Issac and Hurricane Helene. While Helene is currently expected to spin north into the Atlantic, Isaac is on track to break into the Caribbean by Saturday, possibly curving north from there towards the US. The storm’s compact size makes it hard to predict – small storms can quickly intensify or fizzle out without warning.